According to multiple industry sources, Gennady Golovkin's October 17 clash with David Lemieux sold approximately 150,000 pay-per-view units. Although one source informed us that the final tally will be "less than that", we're told some numbers are "still trickling in", so they expect "roughly 150 [thousand]." 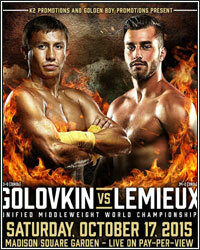 This was Golovkin's first foray into the pay-per-view market. Although he failed to reach the 300,000 mark that previous stars like Oscar De La Hoya and Floyd Mayweather attained in their first pay-per-view outings, the hard-hitting unified middleweight champion was a big hit at the gate, setting a pre-sale record and ultimately selling out Madison Square Garden with an attendance of 20,568. His performance, a dominant 8th-round stoppage, definitely gave fans something to talk about.